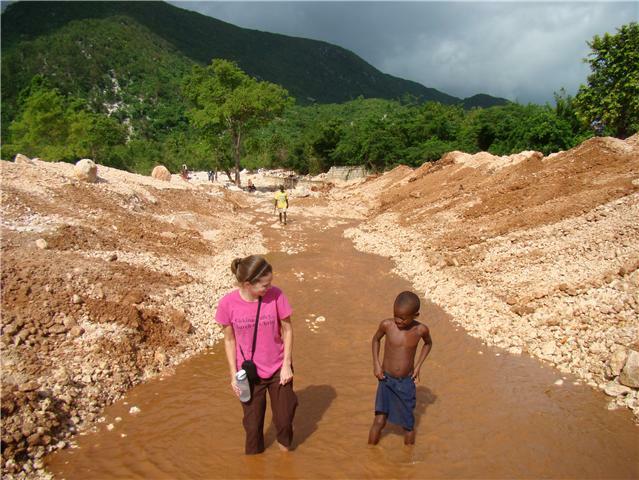 Ginny in Haiti: It's Rainy Season! Living arrangements have also changed dramastically for Odessa and I. The provided housing that Angel Missions Haiti isn't ready for us until after June 10th. So for the past month we have been living in a Haitian house-totally Haitian style. Now I can say I've done it all in Haiti. We have no running water and cook over charcoal for every meal. So that equals bucket baths (which Odessa loves!) and catching every drop of rain water you can so we don't have to buy and carry water home. At least it is rainy season now in Haiti so we are getting rain nearly e very day. Here of some pics of this evening's hard rain and the group effort it takes to fill the buckets, drums and anything else we can find. These are taken inside the house. Yep inside the front door. This pic to the left is a drain from the roof which spouts down water inside the living room! Whenever I am doing hard, manual labor (which is NOT very often) I am always reminded of when I was in grade school and my dad making my brother and I work in the garden behind the house. We hated it. And he always got us started and then managed to "move on to another project" like mowing the grass with the riding mower or stacking firewood-both of which are WAY better than pulling weeds in the garden. And I can't feel at home in this word anymore. This of course was sung in the most pitiful, fatigued, overworked voices we could make. So tonight while swinging the buckets of water and siding the full drums across the floor-those weed pulling muscles triggered an old memory. I was about 2 lines in when the others started singing it in Creole. The King of Kings has prepared a place for me-that's my home. There will be no sin, death or carrying buckets of water. Thank goodness-I was not designed for manual labor! ***I had to put this last pic in so my grandpa could see how the electrical/battery system is set up in this house. By the way Grandpa-does it matter we are standing in front of it on tile floor with rain water everywhere while barefooted? Just wondering. You are seriously inspirational girl! Odessa is going to have the MOST AMAZING memories!